Continuing with the report-format series that talks about the report formats you receive by default when you install the Magnetic Media compliance reports solution, today we’ll talk about the 1007 report format. If you missed the first post, check it out here: Magnetic Media Compliance Reports: The 1005 and 1006 Report Formats. After all, what is the 1007 report format? In a few words, you use the 1007 report format to report gross amounts received by your company during a period of time. These gross revenues comprise returns, refunds, and discounts. Recently, the Colombian government by the means of DIAN (Dirección de Impuestos y Aduanas Nacionales) launched a new version for the 1007 report format, that consequently turned from version 8 to version 9. This new version of the 1007 report format is established in resolution 000060 of 2017, and goes live on 2019 for reporting the fiscal year of 2018. Basically, the changes in the 1007 report format include a new organization for values classification – which now are done through the elements IBRU and DRED of the output XML file. Find below the information you report in the XML output file of the 1007 report format (version 9) when you run the Magnetic Media compliance report. The data described in the table below is extracted for each one of the revenue accounts that you customize and classify as IBRU or DRED. cpt Item type int 4 According to what is specified in the DIAN resolution. This data must be always reported. tdoc Document type int 2 According to what is specified in the DIAN resolution. nid Identification number string 20 Fill this data without hyphens, periods, commas or blank spaces. apl1 First surname of who is reporting string 60 This data is mandatory for natural persons. apl2 Second surname of who is reporting string 60 This data is mandatory for natural persons. Report this data if you have this information. nom1 First name of who is reporting string 60 This data is mandatory for natural persons. nom2 Other names of who is reporting string 60 This data is mandatory for natural persons. raz Social reason string 450 This data is mandatory for legal persons. pais Country of residence int 4 According to what is specified in the DIAN resolution. ibru Gross revenue received long 18 This data must be a positive and whole number. Do not include periods or commas. dred Returns, refunds, and discounts long 18 This data must be a positive and whole number. Do not include periods or commas. Remember that the Item type, Document type y Identification Number fields are composed of a unique key for the 1007 report format, and that this key is repeated for the registers of one sent file. If you report a NIT in the Identification Number field, use the NIT number and its verification digit as well. You can find more information about the report formats in DIAN portal: https://www.dian.gov.co/. 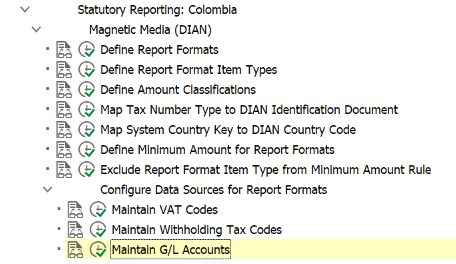 Before you run the 1007 report format (CO_DIAN_1007), you need to configure data sources for the extraction. To do so, you have to assign G/L accounts and their item types according to what is relevant to the 1007 report format, and you also inform their validity and classification. Ready! After doing this configuration, the Magnetic Media compliance reports solution automatically extracts and organizes the relevant information in an XML output file when you run the 1007 report format. We hope this blog post is useful for you. Are you missing any information about the Magnetic Media compliance reports solution? Let us know in the comments. Your doubt can be the subject of our next post. And don’t forget to follow the SAP S/4HANA Finance tag to stay tuned on Magnetic Media latest news.